The Canadian assault on Vimy Ridge was planned by a former real estate agent from Victoria, B.C., General Arthur Currie, and a physicist from McGill University in Montreal, Colonel Andy McNaughton. They had a British commander, like all the Dominions, but this commander, Sir Julian Byng, (later a Governor General: the representative of the monarch (crown), appointed on the advice of the Prime Minister for a term of five years.Governor General of Canada) had the good sense to let the Canadians run their own show. Instead of sticking to the old British approach of frontal attacks on the enemy, the Canadians under Currie decided to analyse the situation first. They used trigonometry: the branch of mathematics that deals with the relations between the sides and angles of triangles and the calculations based on these.trigonometry to figure out exactly where the enemy fire was coming from. And they used a new instrument, the oscilloscope: an electronic instrument for representing wave patterns on the screen of a cathode-ray tube.oscilloscope, to measure the muzzle velocity of their heavy guns. With this information they could set all the sights of their guns to fire volleys that would land in a straight accurate line on the German trenches. Canadian troops could advance more quickly behind this barrage: a barrier of artillery fire to check the enemy or to protect one's own soldiers in advancing or retreating.barrage because the line of danger from falling explosive projectiles was narrow and predictable. The Germans, expecting a long delay between the end of the barrage and the arrival of troops, were surprised by the sudden appearance of Canadian soldiers on the brow of the trench. In two hours the Canadians had taken Vimy Ridge. More than 3000 Canadian young men lost their lives at Vimy and another 7000 suffered injuries, but these horrible casualties were still far less than the British and French had sustained without success, and headlines around the world praised this incredible Canadian achievement. Another famous Canadian battleground was near Ypres, in the Belgian province of West Flanders. This painting by Mary Riter Hamilton was commissioned after the war to mark the battle. 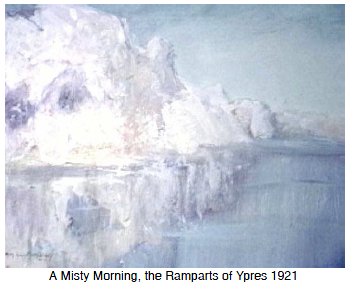 It was at Ypres that poison gas was first used successfully as a weapon of war. On April 22, 1915, the Germans attacked releasing over 160 tons of chlorine gas that wafted in a greenish-yellow cloud toward the allied lines. Chlorine gas turns into hypochlorous acid when it is combined with water, so damage to the eyes and lungs was severe. Many died within minutes from suffocation. Chlorine gas is denser than air, too, so it fell into the trenches, forcing the soldiers to climb out and put themselves into the line of fire. The French and Algerians, taking the brunt of the attack, abandoned their positions creating a 6.4 km gap in the allied line to the left of the Canadians. 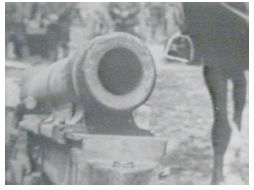 In their first major battle of the war, Canadians stepped in and over the coming days managed to hold on, even though their Ross rifles jammed and the urine-soaked cloths they put to their faces provided small defence against the gas. The 2nd Canadian Brigade at Ypres was led by Arthur Currie who would also be instrumental in the Canadian attack on Vimy Ridge two years later. It was during this Battle of Ypres that the Canadian doctor and Lieutenant Colonel John McCrae wrote the famous poem "In Flanders Fields." After World War I, France gave a 100-hectare parcel of land to Canada, to be held in perpetuity for use as a memorial to the Canadians killed on French soil during the war. The land chosen was the site of the Battle of Vimy Ridge. The monument sits high atop Hill 145, the highest point on the ridge. In the surrounding area visitors can see the pockmarked land and tour restored tunnels and trenches. The monument was designed by Toronto sculptor Walter Seymour Allward. Construction began in 1925 and the memorial was finally unveiled on July 26, 1936. It is made of Seget limestone, from an abandoned Roman quarry near Seget, Croatia, specially chosen by Allward for its durability and luminosity. The various figures surrounding the two rising pylons all have symbolic meaning – from the Mourning Parents of fallen soldiers, to the figure of Mother Canada or Canada Bereft looking into the stone sarcophagus where Canada's war dead lie. While it is a war memorial, its strongest message is peace. The topmost figure on the pylons represents peace and the group of soldiers depicted in Breaking the Sword at the foot of the monument enact one of the strongest symbols of peace ever included in a war memorial. It escaped injury during the Second World War because Adolf Hitler, an admirer of the work, stationed soldiers to guard it from both German and Allied armies after the Germans took control of the region in 1940. 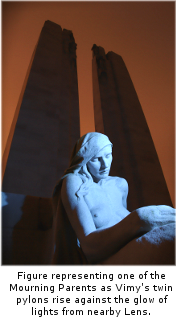 The Vimy Memorial has recently been restored and was rededicated on April 9, 2007, to mark the 90th anniversary of the Battle of Vimy Ridge.